I wouldn't mind a 1926 T roadster with wire wheels and period speed equipment. Alsancle: Yes, I think Peter Kumar of Gullwing Motor Cars bought it back, and then sold it again. I think the aluminum heads were too porous, so they tended to leak. I know my Phantom 1, S460MR, had its original aluminum head replaced with an iron head in 1960 when it was owned by John Maxfield. This was no easy job. New phone number (in Virginia) is 276-952-6126. This is an excellent factory 300SL book. Please make a near offer. Hi, Is your tail lamp an original Trilon or is it one of the recent remakes? I think one could say the same for a Brewster Regent on a Phantom 1 chassis. 1930 ROLLS-ROYCE PHANTOM I REGENT, BREWSTER BODIED RUMBLE SEAT CONVERTIBLE-ROADSTER. Really nice old Rolls with stunning Brewster of New York aluminum body. 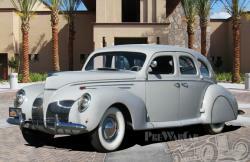 A true 2-seater with Rumble Seat and dual sidemounts, this car is very large (146 1/2 inch WB) and very imposing. Sold new to a California banker it has had only 5 long term owners and shows only 77,000 miles on the odometer. All matching numbers, this car has had its troublesome aluminum cylinder head replaced (in 1960) with a correct Phantom I iron cylinder head. No rust or rot ever, this Rolls is a driver ready to be taken to a Pebble Beach Concour level. I am 78 suffering from declining health and I am selling my collection of antique and collectible cars, toys, and art. Before I consign anything to a national auction house, I thought I would offer the Rolls here. I would be open to serious offers over $150,000. Car collecting can be an addiction. The size of the storage can be a control. OR NOT!